Once a year, the fans of Insane Clown Posse— a group self-anointed the “Juggalos“– gather at Cave-in-Rock, Illinois for a week of music, carnival rides, and partying. In contrast to the Skinhead movement, Juggalos pride themselves on inclusiveness, embracing all races, genders, creeds, and economic backgrounds (though they tend to be drawn, like Skinheads, largely from the economically-challenged), and consider themselves a family. This ain’t Coachella. It’s not even Bonnaroo. We’re used to corporate sponsors, patrons staying in hotel rooms. Everybody in America is a winner, on their way up. But here you have an endless supply of what society calls losers. And they all seem to know it. This film is as powerful as the great documentaries of Frederick Wiseman and D.A. Pennebaker. It captures a vibe, a feeling, which you don’t find too often in today’s mainstream media. I can’t imagine many of these people are Democrats. They want every dollar they earn, because it’s not many. And where’s the better life, the jobs Obama promised? It’s an endless carnival of the disenfranchised. An underbelly pushed under the rug, joining together to have a good time. What happens when your parents aren’t rich, when your life has taken a wrong turn? You get tattoos and become a Juggalo. This certainly ain’t the beautiful people. And it’s not all stoners. There are Straight Edge Juggalos, and if one of the talking heads is to be believed, even brain surgeon Juggalos. But I’m guessing those are in the minority. This is not plastic-surgeried, dieted down to nothing television America. This is the people servicing you, doing those low paying jobs you’ve got contempt for. 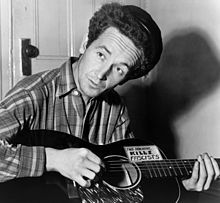 In the 1950s, Guthrie was diagnosed with Huntington’s chorea, a genetic disorder that was treated in those days with confinement to a psychiatric hospital– in Guthrie’s case, Brooklyn State Hospital, then Creedmore– where he spent his last 12 years.